366 pages | 54 B/W Illus. 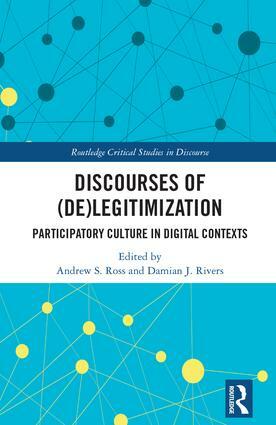 This volume provides a comprehensive analysis of the ways in which digital communication facilitate and inform discourses of legitimization and delegitimization in contemporary participatory cultures. The book draws on multiple theoretical traditions from critical discourse analysis to allow for a greater critical engagement of the ways in which values are either justified or criticized on social media platforms across a variety of social milieus, including the personal, political, religious, corporate, and commercial. The volume highlights data from across ten national contexts and a range of online platforms to demonstrate how these discursive practices manifest themselves differently across a range of settings. Taken together, the seventeen chapters in this book offer a more informed understanding of how these discursive spaces help us to interpret the manner in which digital communication can be used to legitimize or delegitimize, making this book an ideal resource for students and scholars in discourse analysis, sociolinguistics, new media, and media production. Damian J. Rivers is an Associate Professor [Communication] at Future University Hakodate, Japan. His research interests concern critical pedagogies, the discourse of social media and political communities of participation, and expressions of power within educational philosophy, policy and practice. He is co-author of Beyond Native-Speakerism: Current Explorations and Future Visions (2018, Routledge), editor of Resistance to the Known: Counter-Conduct in Language Education (2015) and co-editor of Isms in Language Education: Oppression, Intersectionality and Emancipation (2017), The Sociolinguistics of Hip-Hop as Critical Conscience: Dissatisfaction and Dissent (2017), Native-Speakerism in Japan: Intergroup Dynamics in Foreign Language Education (2013) and Social Identities and Multiple Selves in Foreign Language Education (2013). See www.hakodate7128.com. Routledge Critical Studies in Discourse publishes high quality original research monographs broadly in the area of critical discourse studies. It seeks theoretically innovative and empirically rigorous research that advances our critical understanding of the interrelations of discourse and social processes, including all aspects of power relations (such as maintenance and perpetuation of dominance; negotiations of power and resistance; as well as solidarity formations for group empowerment). The series supports interdisciplinary research, and welcomes investigations of new topics, domains, issues, frameworks and methods, as well as fresh perspectives on established ones, from a variety of international and cultural contexts. A broad understanding of "discourse" is adopted in the series to include systematic and explicit analyses of spoken/written language and other modes of semiosis (e.g. visual images, sounds, gestures and actions).